Recently a good friend of mine posed a question on Facebook asking women, "What is your criteria for a Good Man?" As expected, there were an assortment of answers that were garnered, but there appeared to be one factor that was consistent amongst all those who answered. It would appear that in order for a man to be considered a 'Good Man' he must put God first. This caused me to think. Does putting God first automatically qualifies a person as a 'Good' person? And, exactly what does putting God first actually mean? We can look throughout history and find plenty of people that have strong beliefs in the Creator, but we would not consider these people to be 'Good' people. Just look at the Ku Klux Klan for instance. It was an organization started by Christian men who supposedly had God at the head of their lives. How about the Catholic priests that raped and molested children? Obviously, some part of them have an immense love for God. If not, then I'm willing to bet they would not have dedicated their lives to serving God. And please don't get me started on some of these preachers, prophets, prophetesses, and evangelists that are currently pimping the church. I have a really good friend who loves the Lord. He's in church every Sunday and Bible Study on Wednesday. He even sings in the choir, but he's never been in a relationship in which he's been faithful. So is he a Good man or not? I can say he is the best damn friend I have, but Lord knows I would never, ever date him. I realize people like to make statements because it sound good at the time. We've heard someone, our pastor perhaps, make a statement and we immediately assume this applies to us, but do any of us really know what it means to put God first. You have opened up Pandora's box with this one. I've been biting my tongue when it comes to church, God, "godly" living, etc. But I won't get on my soapbox about here. I will say though. It sounds good to say "I want someone who puts God first." If a person puts God first, then everything else should fall in line, right? But what exactly does putting God first look like? I guess it depends on who you ask. In terms of does making that statement make him a good person? No it does not. Does being a good person equate to trustworthiness, faithfulness, and integrity? No. Can you be a good person just immature? Yes. Can you be a good person but struggle in certain areas? Yes. Is being a good person the only criteria for a suitable mate? Not hardly. If we look to man (now or throughout history) to define "godly living" or being "good" we will never get a consistent answer. Unfortunately, those who claim to live according to a religion, faith, or system of beliefs, cannot be trusted to be adequate representatives of that religion, faith, or system of beliefs. Instead, we must go to God, not man, and see what He says on the matter. In Christianity, these questions are answered in the Bible which is God's Word. Being "Godly" or "good" or "putting God first" means total surrender to Jesus as your Savior and Lord, and yielding to His will and direction in all facets of life. It means being led by the Spirit and rejecting sinful desires with the power that the Spirit gives. It means loving God with all of your heart, mind, soul, body, and strength; and loving your neighbor as yourself. 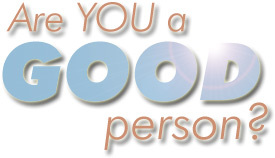 If someone does this, then yes, they will be a good person because God will be the source of the goodness in them, and He will be empowering them to live a good and Godly life. God is very clear that He hates hypocrisy (saying that you serve God, but doing things that God hates). Jesus said, you will be able to discern hypocrites by what they do (Matt 7:15-16). Jesus said that hypocrites will come to Him on judgement day and say Lord, didn't we do great things in your Name? Jesus will tell these hypocrites to depart, because He never accepted their way of life (Matt. 7:21-23). The Bible counsels us to seek a mate who is in agreement (words and lifestyle) with us with these Biblical principles.